Cancer is a deadly disease which can affect any part of the body. Kidney is one of the essential organs in the human body. It performs some essential functions like waste excretion, water level balancing, acid regulation, blood pressure regulation and red blood cell regulation. Cancer can affect your kidneys as well. Kidney cancer is considered very dangerous. However, before the onset of cancer in the kidneys, the human body gives some indications. It is very important to identify these signs and symptoms at the right time. Kidney cancer can affect anyone but usually, people who drink alcohol or smoke are more prone to this form of cancer. Lower back is often considered normal but it is also a lesser known symptom of kidney cancer. Most people experience lower back pain after the complete progression of the disease. The pain is usually sharp which can cause a lot of discomforts. Blood is urine is the first symptom of kidney related diseases. Blood in the urine can hint kidney cancer as well. Sometimes the quantity of the blood is so small that it can be detected by a urine test only. If you notice blood in your urine then you must visit your doctor in such a condition. The kidneys control the production of red blood cells as well. Kidney cancer can lead to decreased production of red blood cells. This condition leads to anemia. Due to anemia, you may also feel fatigued most of the time. 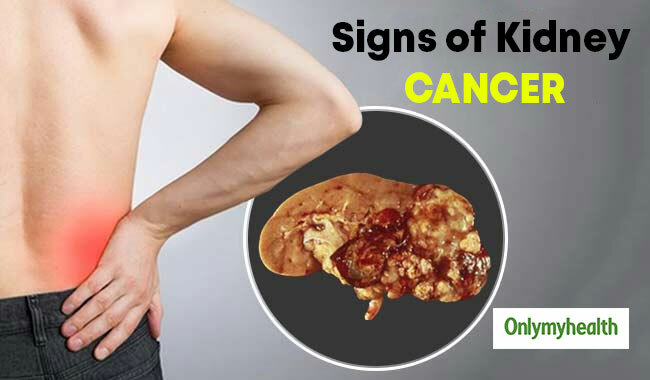 If you are losing weight without trying then it may indicate kidney cancer. As the tumor spreads you may feel less hungry. It will make you eat less which will result in weight loss. Poor kidney health will also promote weight loss. A lump around the abdomen or near the kidney can be a sign of kidney cancer. The lump is usually hard in the early stage. Further tests can help the doctors to find the exact reason behind the lump. First, the doctor will examine the common symptoms of kidney cancer. The doctor will ask you to go through certain tests like urine test, blood test, ultrasound, CT scan and MRI to examine further. In addition, the patient has to go through a biopsy which will provide accurate information about cancer, because in this investigation, a small tissue is removed from the kidney for investigation. Kidney cancer is usually treated by radiation, chemotherapy and surgery. First, the doctors will determine the stage of the cancer. Later other parts near to the kidneys are examined to check the spread of cancer. After this process, the treatment starts. If you experience these symptoms then you must consult your doctor immediately. Early detection will help you control the progression of the cancer. Kidney cancer can affect the various major function of the human body. So, the development of the cancer should be controlled at the earliest.